I have been chosen to join the Scrap-N-Pieces Creative Team! I am very excited about this and for the opportunity to learn and grow that it will provide me. 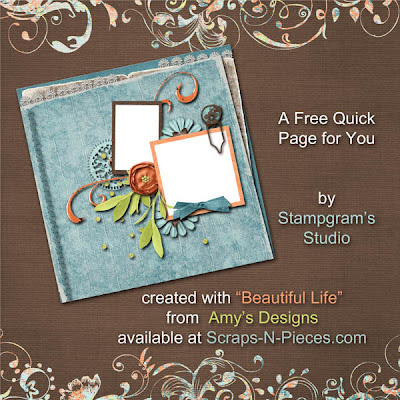 This week I was able to work with the "Beautiful Life" kit from Amy's Designs. 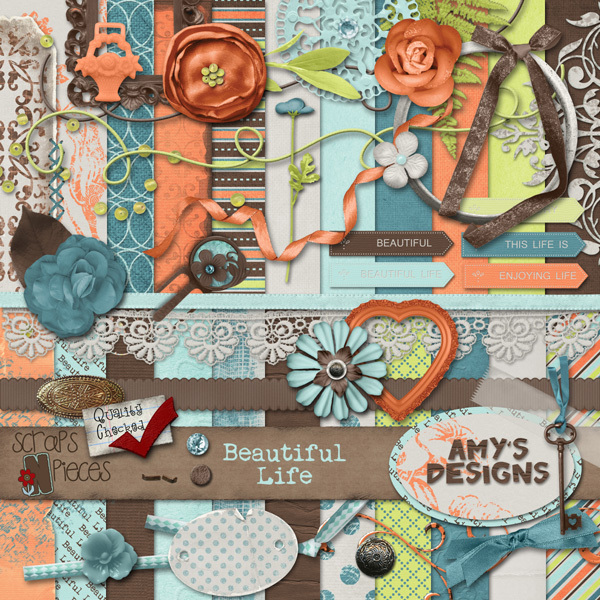 Amy is the featured designer at Scraps-N-Pieces right now and her store is all on sale for 50% off until May 15th. 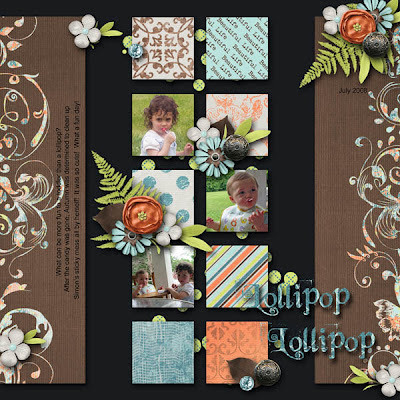 This kit has such pretty colors, gorgeous papers, and lovely elements! The hardest part was deciding which pictures to scrap. I made two layouts. The first one is done on the May Challenge template available in the SNP store this month. Why don't you go grab it HERE and join the Challenge! For this layout I used several of the papers from the kit for the little squares in the layout, and a beautifully decorated brown paper for the main background piece. I love how the flowers pop against that brown background! 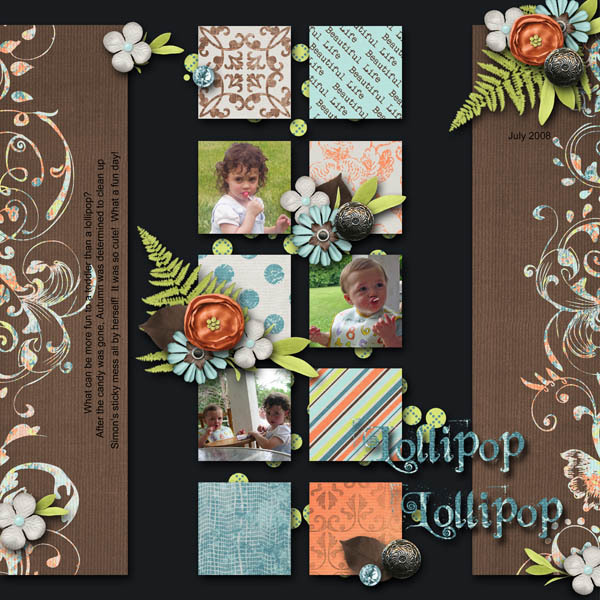 This is a page about Lollipops - it is so fun to watch toddler grandchildren eat them even though they do get so sticky. The second layout was done using a variation on Bethany's class kit template which she so graciously allowed me to use to create this layout - and a QP for you. You can grab the template for free right now. There is a link on her blog HERE, along with her class kit. I think it adapted really well to the pretty papers in the "Beautiful Life" kit. There are so many different papers in there it was hard to choose which ones I liked best but I do tend toward those gorgeous blues and browns. They are so versatile for many subjects. This layout has been made into a quick page for you. 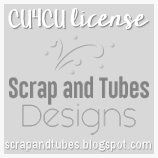 You can download it from the Scraps-N-Pieces blog HERE. I hope you enjoy it and will run over to the Scraps-N-Pieces store to get this Beautiful kit. Guess what?!?!?! YOU WON THE CAMERA BAG!!!! WOOT WOOT! Send me your mailing info and I will ship to you! Love the layouts you've done here! And also congratulations on your Creative Team position! I'll bet you are so excited!